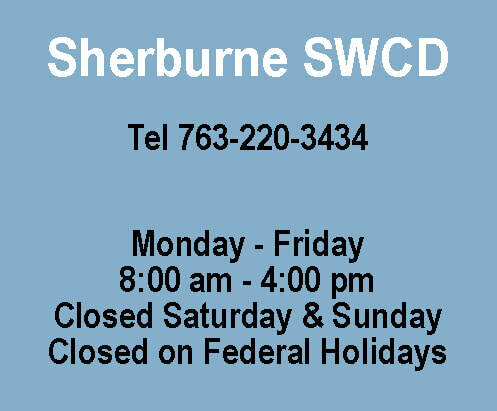 Welcome to Sherburne SWCD's Water Quality Monitoring Program page. The purpose of this page is to provide information about water quality within Sherburne County's rivers and streams. This site provides access to raw water quality data that is currently being collected by Sherburne SWCD and other local partners. Tracking the condition of water quality throughout Minnesota's streams, lakes and rivers is a monumental task. Minnesota Pollution Control Agency is responsible for tracking, collecting and analyzing this information. The Sherburne SWCD operates a Rainfall Monitoring Program throughout the county. Rain gauges are read and recorded daily by our citizen volunteers. At the end of each month our volunteers submit their readings to the SWCD. The SWCD then submits those data records to the statewide archives maintained by the State Climatology Office. This information is used for lake level and stream flow predictions, justifying crop losses, tracking drought conditions, predicting future weather conditions, and for research at many levels. This data has proven to be very helpful at the local and statewide levels.